When you’ve popped the question and your partner says yes, the next question is usually, “When?” followed by “They say spend how much on the rings? !” Ignore “them.” You can stay well under that budget and still wear quality. These tips will help you get the most bang for your buck while still showing off beautiful, affordable wedding rings. Note: This post was provided by Apples of Gold, but I was not paid to publish it. My Online Wedding Help will receive a small commission at no added cost to you if you click and buy a product on the site. Although this may seem like a no-brainer, it’s easy to go overboard when you find a gorgeous ring that you think you’ve got to have. Chances are, if you look carefully you’ll find another ring that tickles your fancy just as much but stays within your budget. Don’t rationalize overspending. Stick to what you know you can afford. Find the above ring here. For example, do you love the look of princess-cut halo diamond ring? 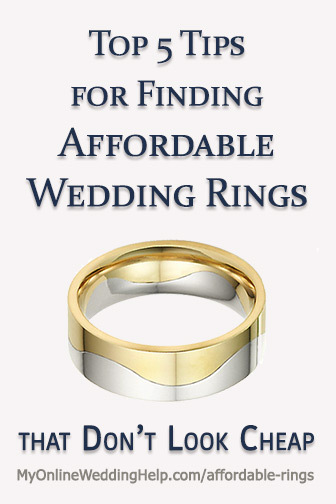 As you research you will quickly find designer rings priced upward from $2,500. Then realize that’s the setting only! Center stone not included. The one above has a similar look at much less for the entire ring. Leaving yourselves plenty of time (about six weeks or so) will give you the greatest options. When you shop around, you have the opportunity to compare quality, beauty, and price. Also, the more you look, the more familiar you get with metals and gems. And the more familiar you are, the better choice you will make. 3. In a store or online? 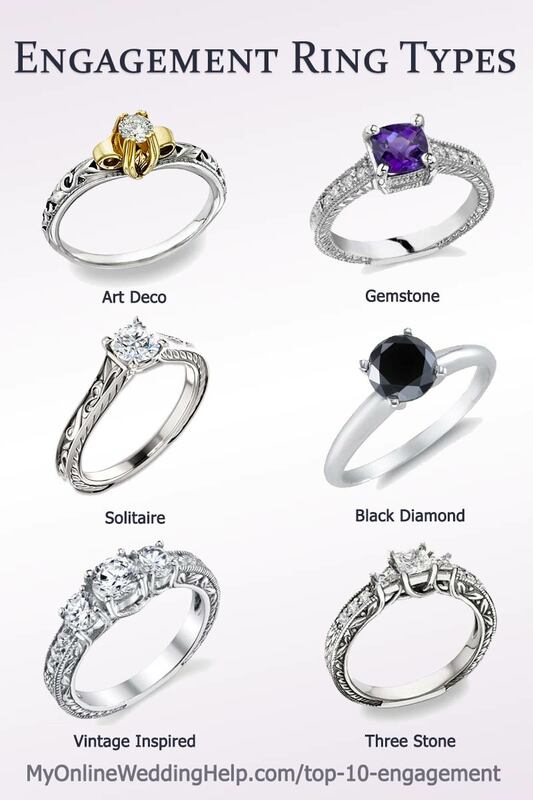 Many people prefer to shop retail stores because they love seeing the rings up close. That will cost you about 20-30% more than shopping online. Online merchants do not have the overhead that brick-and-mortar stores do. And they don’t have to stock huge inventory for you to have a wider variety to look at. And, because you have given yourselves enough time, it’s not a problem to wait a few days more for shipping. Whichever way you go, check out the merchant’s guarantees as well as their Better Business Bureau score. Apples of Gold, by the way, has an A+ rating. Find the above, part of the Top 10 Engagement Rings collection, here. Gold and platinum remain the ultimate in wedding bands. And you cannot go wrong with the most popular, white gold wedding bands. But other metals can be as beautiful, and you can find a stellar ring in a metal that doesn’t cost as much. Consider two that are rising in popularity: tungsten and titanium. Both are beautiful metals but are less costly than the classics. They also have some advantages over gold and platinum. They are stronger and more scratch-resistant. Top: Titanium Blue Infinity Celtic Wedding Band. If you like the look of platinum, research Argentium silver and cobalt chrome. They closely resemble platinum without the hefty price tag. 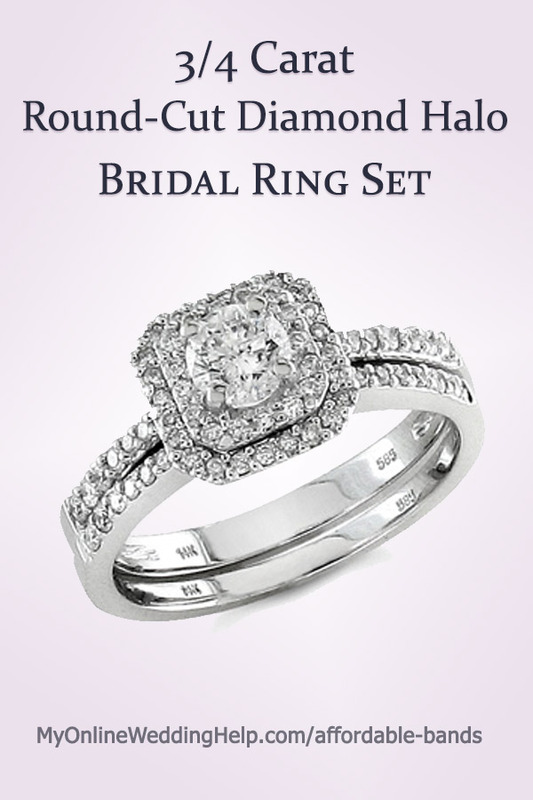 Many sellers have lower prices when you buy a package deal, such as an engagement ring and a wedding band together. 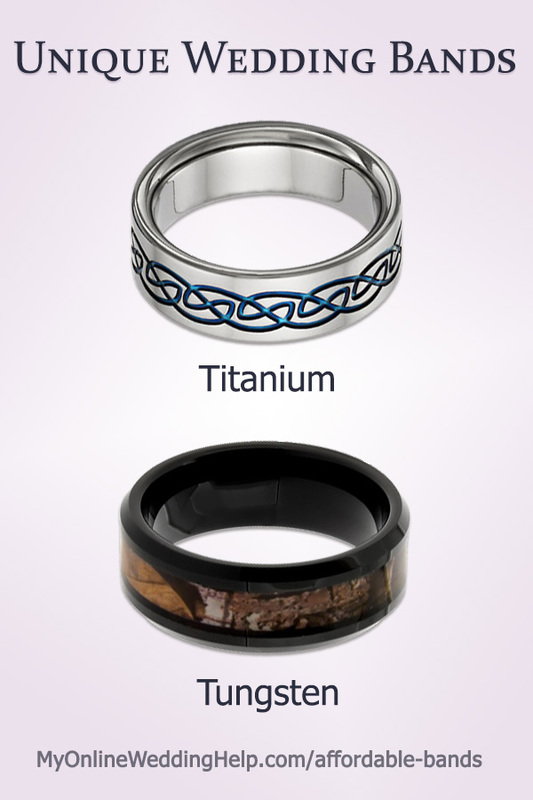 Another option is buying men’s and women’s rings at the same time, especially when sold as a set. These deals tend to pop up around holidays. Look for them immediately after Christmas, in late spring, and early summer. Now that congratulations are in order, be sure to give ring buying the attention and careful consideration it deserves. After all, a wise buy now means you’ll wear your wedding band happily for many years to come. I find it amazing that you said that getting a bridal set will help a couple save money when buying a woman’s ring and a male’s ring. When you said that, I thought about looking online with my cousin’s boyfriend for a bridal set. Doing this will help cross one thing off their future wedding preparations.